Hugh Ballou > Podcast > Podcast 60: Reverse Polarities – Must We Be Right or Wrong? Podcast 60: Reverse Polarities – Must We Be Right or Wrong? Must We Be Right or Wrong? It’s interesting to observe in the news accounts of politics the fact that people with opposing opinions both claim to be precisely correct. Is there a danger in claiming to be right? Is structure right or wrong? I observe that there is typically common ground in diverse points of view and that many people don’t know how to get that perspective lost in the debate or argument about who is right and who is wrong. Getting unstuck often is about observing reverse polarities. Is It One or the Other…Or Both? In my discipline as a musician, I understand that creativity is unleashed when the structure is clear. In addition, it’s crucial for the performer(s) to master the techniques and the notes, to then be able to be creative. My 4th leadership principle is about Systems, “Rehearse for Success.” It’s mastering the notes that leads to excellence in performance. We don’t utilize this concept in non-musical settings. It’s easier to just go directly to performance and continue playing the wrong notes, so to speak. Our practice is to continue to proceed by ignoring the very things that compromise our performance and limit our results. There’s a natural tension between form and freedom. There are many ways to interpret this dynamic. As a musician, I’m able to process information by using both sides of my brain. Those who are not musicians consider us to be right-brain thinkers without structure, when, in fact, we must learn to be creative within a very rigid structure. Music is a highly structured and organized system that’s mathematical and linear, very much like computer programming. This podcast is part one on the topic of the reverse paradigm of form versus freedom. I invite your comments as I explore the different ways this principle plays out in the cultures we lead. Here are some of the parameters for unleashing creativity through structure:Also, tStructure Enables Creativity: If you have ever listened to a jazz ensemble, you might not have realized that this most creative of musical performance genres is actually very structured. To a non-musician, it seems as if there is no structure and the performers just make things up. Well, not true. The chord structure, the meter, the tempo, the form, and the melody, are just a few of the things that are structured. Mastering these elements allows each performer to then improvise around this structure. This is a simultaneous right/left brain function – being creative within a structure. Getting off the chord progression, or playing too loud when it’s not your solo, are reasons for not being invited to the next performance with that ensemble. Knowing the structure allows each performer to then be creative…they don’t need to spend energy thinking about what’s already defined. This is the same principle in non-musical settings: the structure prompts and encourages active engagement. Consistency: Knowing the sequence and the milestones allows all the participants to coordinate efforts. 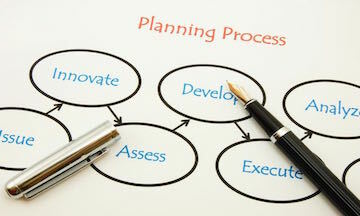 The plan identifies what activities are concurrent and which are continuous. It also identifies what activities depend on the completion of other activities. This is necessary for consistency and synergy in the group’s performance. Quality: When the outcomes are specifically defined, the benchmark for quality is a measurable objective. Quality, like artistry, is attention to detail. If the plan is good and the team is engaged, then there’s an identifiable quality standard for all. Control: Having the plan written with clearly defined objectives, and successfully articulated and communicated to all team members, allows the team to develop the synergy of peer-to-peer accountability, similar to how an ensemble develops its synergy. The orchestra or choir develops what is defined as “ensemble” which is a higher standard of unity. First of all, t’s not something the conductor can force, however it’s something the conductor inspires and creates the space to happen. Also, the same is true for leadership in general. Create the expectations…define the process and accountabilities…get out of the way…nurture and coach for success…affirm success…be the example…be faithful to the process you champion. Structure is the container for freedom and creativity.